TSA India to the Rescue! 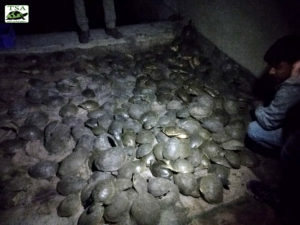 TSA India conservationist Rishika Dubla reports that over 1500 Indian Flapshell Turtles (Lissemys punctata) were seized this morning near Lucknow, Uttar Pradesh, through a joint operation between the Uttar Pradesh Special Task Force (Police Department) and Uttar Pradesh Forest and Wildlife Department. 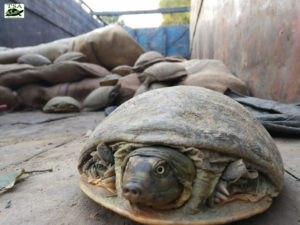 An Indian Flapshell Turtle rests in front of the burlap sacks they were rescued from in Lucknow. 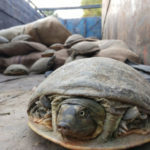 A truck was intercepted by the team where the animals, apparently taken from a wetland complex of Etawa and Mainpuri, had been stuffed into 43 burlap gunny sacks. Two men were apprehended in the seizure and the animals were transported to the Kukrail Gharial and Turtle Rehabilitation Centre. Poachers had stashed 1,500 Indian Flapshell Turtle for shipment. Our TSA India team assisted with the primary handling and veterinary triage at the center, where the cohort will be evaluated with closer detail, and given appropriate medical treatment and proper care in the coming days. 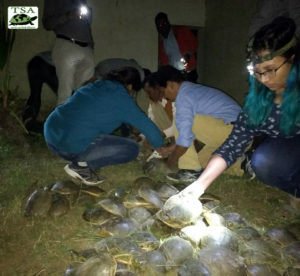 TSA India’s Riskika Dubla and members of the Special Task Force inspect rescued Indian Flapshell Turtles in the early hours of the morning. How I can be a member of TSA India? Please suggest.